HELP send DemonLover to RomCon and WIN! | Got Fiction? 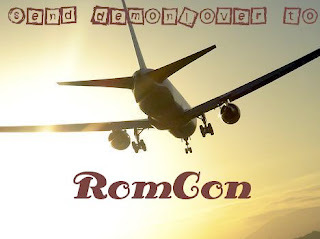 HELP send DemonLover to RomCon and WIN! and you’re entered to WIN! So I was chatting with a fellow blogger and telling her how tight money is for all of us right now … I was laid off in January of this year and am pinching the pennies. So…I was commenting on how I still need to pay for my airline ticket and hotel @ RomCon. you will be entered into a drawing for an entire box of goodies. Entering this contest is simple, just make a donation. Just to sweeten the pot, I have a 2 signed books that I’m adding to the box myself. That way I can make sure your name’s in the drawing! Day 1 of Book-a-day Giveaway! Hope you get to go! Take care!! Only $482 now, my money is in the pot as I can’t go at least maybe you will!!! I will be spreading the word also so hope it will help!! Thank you ladies for your donations! WHEN you get there-have a blast for those of us who aren’t attending. I miss Denver-lived there 3 years and LOVED it! Thank you Marianne for the generous donation, I will definately share the experience with all of you and bring back lots of goodies! Every little bit someone donates helps. I hope you get to go 🙂 Good luck ? This is such a great idea! Do you mind if I borrow it for my own RomCon trip?